Yet another Believe It Or Not knockoff, this one was produced by Walter Galli for the Western Newspaper Union syndicate. WNU catered primarily to weekly papers with a line-up that included a combination of their own material, like Mickie The Printer's Devil, The Featherheads and Finney of the Force, plus reprints from other syndicates. Galli's other verified syndication credit is Stranger Than Fiction, also a Ripley simulacrum, and it was produced from about 1934 to 36. Then Galli switched syndicates, switched titles, and kept on doing the exact same material with But It's True. This feature is known to have run at least 1937 to 1939, but perhaps longer. Western Newspaper Union was pretty lackadaisical about advertising their wares in the E&P syndicate directory, so I can only go by the tearsheets in my collection for running dates. Do you have any earlier or later? You'll note that our example includes a text piece at the bottom giving further information about the illustrated items. Not many people realize that this was for a long time a typical feature of the 'oddities' panels. Ripley's original included it for many years as did most of the better knock-offs. However, most newpapers seemed to consider the text portion a throwaway and few printed it. Some oddities panels, instead of further discussion of the illustrated item, just printed an address and offered to send proof of any item by return mail. Curiously, I've never seen any of these proof letters offered for sale. Have you? One of the earliest continuing features from my beloved World Color Printing was The Adventures of Constable Hayrick, The Rustic Sleuth. It started on 8/11/1901 in a comic section otherwise monopolized by one-shot strips and panels. As can be seen from our example, the art by one Albert Bloch (or Block, I've never been sure) is primitive as can be. The cartoonist (or perhaps the pressmen) didn't even know to leave the background white on the word balloons, so not only is the art amateurish, the entire presentation leaves a great deal to be desired. The strip is pretty standard fodder for the time. Cartoonists in these early days seemed never to tire of spoofing the rural folk. A comic section without a dumb farmer or a cornfed fish out of water in the big city just wouldn't have seemed complete. Occasionally a cartoonist would get the bright idea of having the farm folk outsmart the city slickers, but even that turnabout was a pretty hackneyed concept by 1901. Bloch throws in the minor wrinkle of making his half-wit farmer a wannabe Sherlock Holmes, but doesn't really do anything all that interesting with the idea. Hayrick's sleuthing is mostly confined to outwitting farmboys stealing apples and giving hobo grifters the bum's rush out of town. 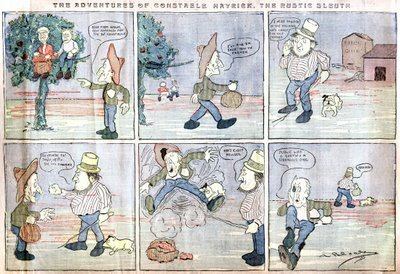 Bloch produced the Constable Hayrick strip pretty much every week, as well as contributing a lot of additional one-shot material to the section. But Bloch left the syndicate soon and Hayrick was put on ice after the episode of 10/6/1901. 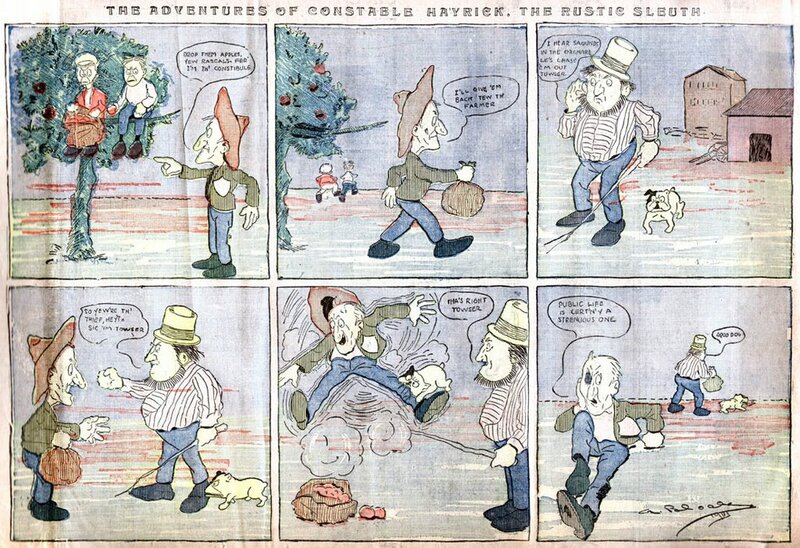 However, the feature was revived in 1902 by Dink Shannon, an excellent cartoonist. His stewardship lasted just three weeks, from 9/7 to 9/21/1902. The constable made one final appearance in the section of 10/12/1902, this time signed by Bloch again. My guess is that this is either a rerun from the first series or a leftover strip that never made it into the section back in 1901. Completely OT, I have talked to Kees Kousemakar of www.Lambiek.nl, which is quickly turning out to be the largest and most complete website devoted to comic art and artists. They have over 8.000 biographies of different artists from all over the world. I have urged him to contact you as well, because much of the information on your blog would be great for him to add. Contact me privately if you want me to make contact with him for you (or the other way around). Please see "Legalities" along the blog sidebar regarding republishing these essays. And that's the end of our little visit to the world of Us Boys. So what did you think? After enjoying today's helping of Us Boys, take another look at the blog post on Roy Rogers. Alberto Becattini has sent on a lot of information that has been added to to the post. I was hanging a well-drawn caricature of my dad probably made circa 1960 in Columbus,Ohio, with the signature "Kaliff". Could that be Joe Kaliff, the comic strip cartoonist? No idea, Ric. I have seen none of his work. I have 4 of Joe Kaliff origianl Karikatures, along with articles from a newspaper in 1961 about him. Does anyone know where I might sell these? Like many people, I tend to ignore a comic strip if the art is unattractive. That's a bit unfair, because in some cases those badly drawn strips were successfully syndicated based on the strength of the story or gags. So while there are plenty of strips around that make you scratch your head in wonder that any editor picked them up, some badly drawn strips are jewels in spite of their artistic shortcomings. I admit to not ever having read any of Tom McNamara's Us Boys until recently despite plenty of opportunities. The strip is downright painful to look at, with amateurishly drawn characters, no backgrounds, and a surfeit of text in many strips. 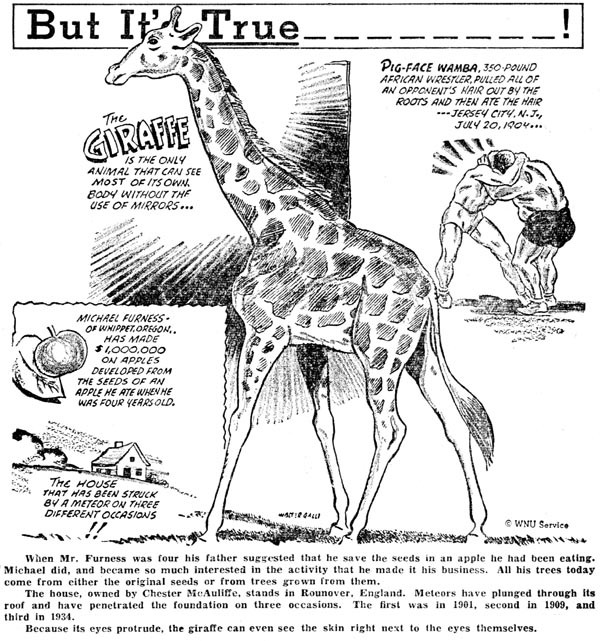 But I was clipping a month's worth of 1921 Columbus Dispatch strips the other day, and I was looking for a good candidate for running on the blog. So I forced myself to give Us Boys a chance. As you can guess from its appearance here on the blog, I think I've stumbled upon a minor gem. First of all, I didn't even realize that the strip had a continuity. Nor did I realize that the continuity seems to have included the Sundays , a rare thing in the early 20s (the Dispatch didn't run the Sundays but there are obvious gaps and recaps that indicate such). The gags are thoughtful, sometimes quite inventive. And most importantly, the strip had a humanity about it that I never would have guessed from the primitive drawing style. In this sequence McNamara has a low-key way of presenting the societal ill of poverty that is powerful in its understatement. He teaches kids morality lessons in such a sly off-hand way that they won't realize they're being educated (naturally, kids are instinctually repelled by entertainment with a lesson ). So give Us Boys a try and let me know what you think. The sequence, which ran in the Christmas season, will only be about three and a half weeks of strips. And if you care to share with other blog-readers and myself some of your picks for undiscovered gems, by all means please do. Futurist illustrator Art Radebaugh was in the waning years of an impressive career when he created Closer Than We Think for the Chicago Tribune-New York News Syndicate. He had been producing advertising art and illustrations featuring his unique visions of the future starting in the mid-1930s. His sleek air-brushed fantasies were used on magazine covers, in automobile ads, even in Coca-Cola marketing. Closer Than We Think was a Sunday panel that ran from 1/12/1958 through 1/6/1963. Each week Radebaugh would look at some aspect of future life with a few paragraphs of text and a detailed drawing replete with arrows pointing out points of special interest. Radebaugh's future vision was Jetsons-like, full of floating cars, flying saucers and push-button technological magic. If only newspaper comic sections could have reproduced airbrush drawings, Radebaugh would have had a huge hit on his hands. The artist's airbrush work was gorgeous stuff. Unfortunately, due to the limitations of high-speed color presses, Radebaugh was forced to use alternative methods. As a substitute for the airbrush he used stippling and shading techniques to supply a simulation of the depth and startling realism of the drawings he had usually produced for fine coated magazine paper stock. The shading method was a disaster from the start. The finely drawn details turned to mud on the newspaper page, giving the feature a dark and dingy appearance. For reasons that I can't guess, he continued using the technique despite the problem. It has to be considered a huge tribute to Radebaugh's unique vision that the feature lasted even as long as it did. To enjoy a much more thorough biography of Art Radebaugh, and see an eye-popping sampling of his amazing creations, be sure to visit the Palace of Culture. Another reason you might mention for the failure of the feature could be that none of his predictions about the future ever came true. While the readers at the time would not have known that, the ideas mentioned are usually so farfetched that one might have felt how improbable they were. This is one of the reasons I like this feature so much. I have quite a large run and it is hilarious. All the ideas are supposedly based on factual reports and research... yet all of them are presented in a form or a future that never came. He might have done better if he called it Silly Inventions. Take the one represented here... based on the words of a general, Radebough warns about a future where the Rsussians might use psycho-chemicals. Nowhere is mentioned that gas warfare was then as it is now forbidden by all nations. I don't even know if experimenting with them, as the general suggests, would not have let to an outrage by other nations. If done, it should have been done clandestinely... which it might have, of course. The 'saucer gas carrier' makes it all the more unbelievable. What's the suggestion here? That the socalled 'flying saucers' are actually secret aircraft from the Russians? I don't think anyone was expected to take his predictions too seriously. They were utopian visions, meant for wide-eyed kids to whom the future has limitless possibilities. And as to gas warfare, who knows what the Bush administration will come up with next. Apparently they can delude themselves into thinking absolutely anything is okay if it is in the service of national security. If you like futurism in comics, what do you think of "Our New Age"? This one also goes on some bizarre tacks occasionally, but lots of their predictions were quite down to earth and have come true (I recall reading one from the sixties that said everyone would soon be using mobile telephones that bounced signals off of antennas distributed all over the world). What I've seen from Our New Age is interesting, but somehow the artstyle, whiloe intersting, just doesn't grab me. Too slick, I guess. And while we are on the subject of sf strips... I mean to go up and look for the title all week now, but have you ever seen any samples of Warren Tufts satirical sf strip done in between Casey Ruggles and Lance? Done in a Li'l Abner style, he says in his 'biography' that he did the strip for half a year to give himself some time to prepare for Lance. But was it ever published? Yes, I have seen proof that Tufts' "Lone Spaceman" strip did run. For the longest time I too thought it just a legend. Don't have access to my files right now, and I can't remember what proof was found. As for Our New Age, I know what you mean about it being too slick. You're probably thinking of the later Gene Fawcette material, though. Look for the early Earl Cros / E.C. Felton (same guy probably) which was more in the wild vein of Radebaugh.